shaving stand with Mach3 ® razor, shaving brush,stand with bowl. 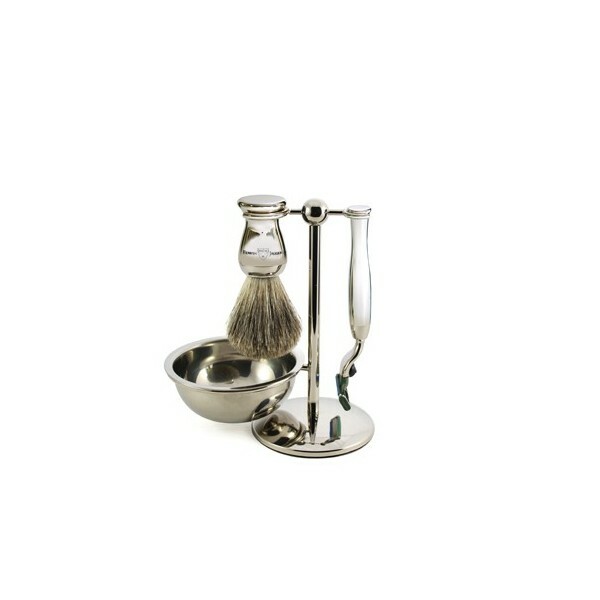 Four piece nickel plated set, includes soap bowl, badger hair shaving brush and Mach3 ® razor. Handmade in Sheffield. Edwin Jagger is Europe's leading manufacturer of handmade shaving razors, shaving brushes and male grooming accessories. 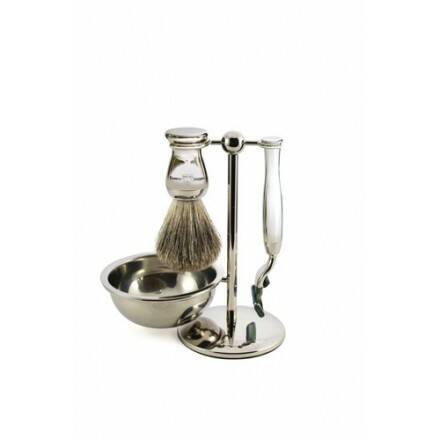 Four piece nickel plated shaving set including razor, stand, soap bowl and grey badger hair shaving brush. For use with Gillette® Mach 3® blades, use Edwin Jagger shaving soaps, exfoliant and pre shave lotion for the ultimate wet shave, all made from natural ingredients. Exquisite traditional wet shave items of the highest quality.